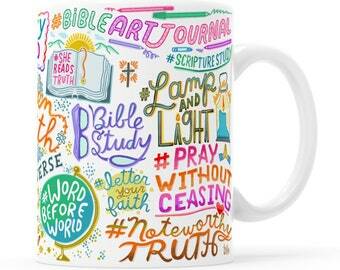 Mugs, tees, coloring books and more featuring hand-lettered, uniquely original art with funny, inspirational and motivational messages. All original hand lettering and art by me, Kathy Weller! •ALL of my artwork is ORIGINAL, unique, + illustrated by me and ONLY me. No fonts, no clip art! ALL of my artwork and designs in this shop are formally registered with the United states Copyright Office. Please respect my originality, original designs + copy as well as the expressed creativity of other creators + makers and Do Not (Try To) Steal My Work. Thank you!! 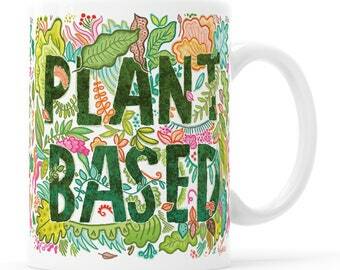 • Mugs: printed + shipped by my mug partners in the USA. 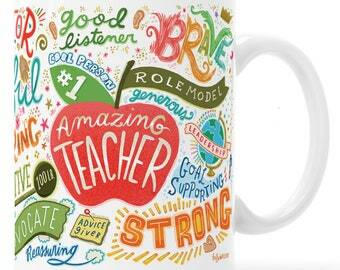 Creation of your mug (pre-shipping) can be up to 4 business days production time. • T's: printed + shipped by my tee partners in CA, USA. 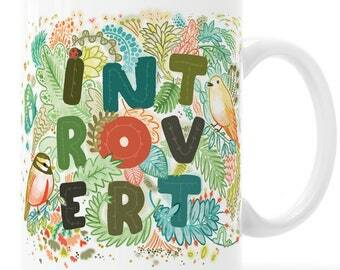 >> DO YOU DO CUSTOM MUG DESIGNS? Yes! 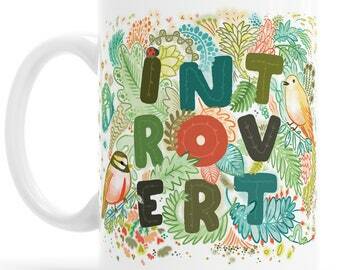 I have two options for custom mug design available. Both listings have all details in the listing, regarding what is included in the custom mug design what is not included, and how the commission works. Please note, the fee for a custom mug design does NOT include ANY actual mugs, which will need to be purchased separately. >> WILL YOU ALTER ONE OF YOUR EXISTING DESIGNS FOR ME? No. I do not alter my existing designs. No exceptions. 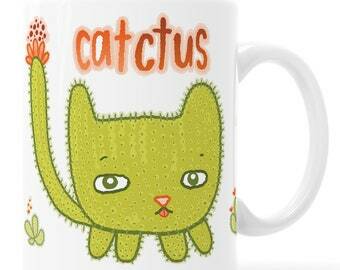 If you want any custom mug work, please check out the custom mug listings above. 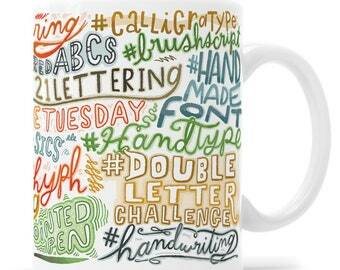 Creation of your mug (before shipping) CAN TAKE UP TO 7 (seven) BUSINESS DAYS PRODUCTION TIME. 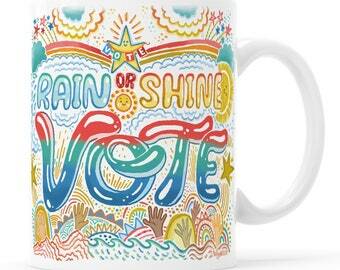 Please allow for this time when ordering your mugs. Thanks! 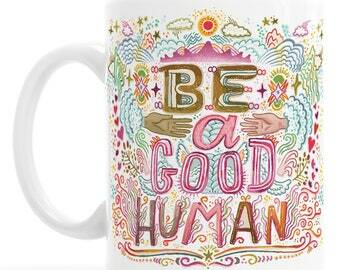 Larger orders of more than five mugs can take longer. 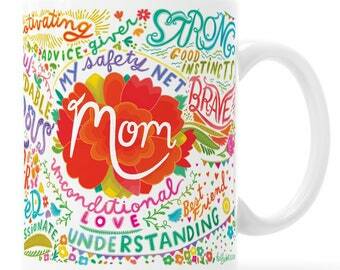 Please Convo Kathy before ordering if you need your larger order of mugs on a specific time line. I ship internationally. The carrier and timeframe can vary depending on destination. I provide all the information I have to you. Thank you for reading and for your support of my art and livelihood. Hello! Welcome to my Happy Land of MUGS! Video summary: See the size difference between my 11 oz and 15 oz mugs. Hi, I'm Kathy. 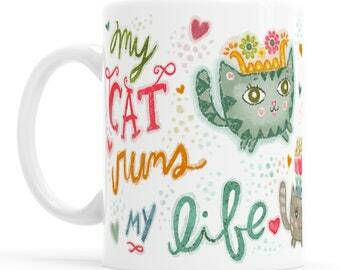 WELCOME to my Happy Land of Mugs! 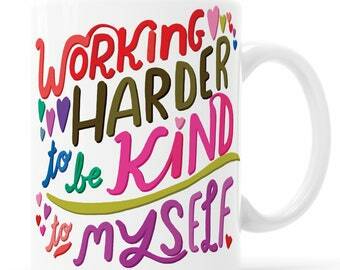 Mugs have become my own magical canvas for creating empathetic, encouraging, funny and sometimes cathartic sayings to help people feel good, supported, or just to simply laugh! They are also a blank slate for my own inner-thoughts, hopes, and dreams... Oh! And don't forget the sarcasm + humor! (Very important.) 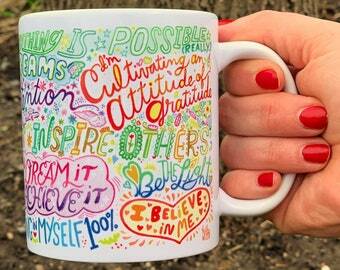 My mugs are a huge catalyst for my own self-expression, and my desire to help others to feel creative and express themselves! The art that you live with and use in small moments of your day, can have a deeply significant impact on your own well-being and on your outlook on life. 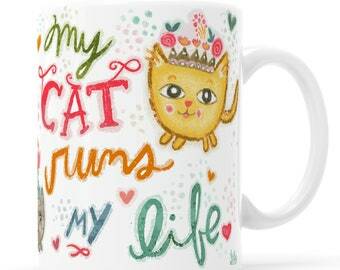 My mug art encourages positivity and good vibes, enriching your life in those simple moments when you are having your morning coffee, evening tea or anything in between! 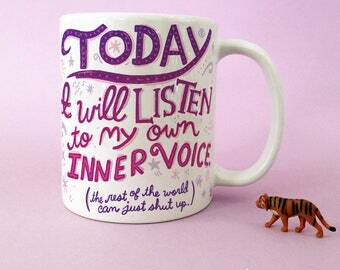 What could be a small, fleeting moment turns into something special, introspective, joyful, and even empowering when you are in tune with your mug! I love coming up with new designs and writing or choosing new sayings. They are colorful and a surprisingly unique and fun way to help you express your thoughts, feelings, opinions and personality everyday, at any time, and for every mood! Thank you for visiting! I hope you enjoy my mugs! Hi! I'm Kathy! 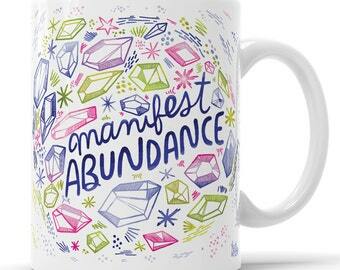 Creative dynamo, positivity pro, hand lettering artist! 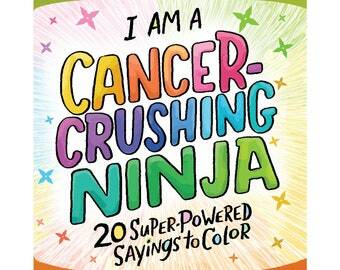 This self-publishing company os how I create some of my books! Gooten supplies product, prints my designs on them, and ships them to my customers. This self-publishing company is how I create some of my books! Print on demand production and fulfillment. I am Kathy, an independent artist. 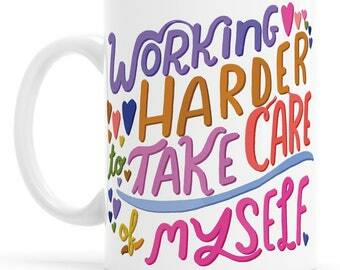 ALL of my mugs and products feature original designs created by me and ONLY me! No clip art, no fonts. All original hand lettering and original illustrated designs. They are special unique gifts from the maker to you, that you won't find anywhere else. Celebrate originality!!! The mugs I sell are made with my excellent partners Spoke Custom in Atlanta, Georgia. 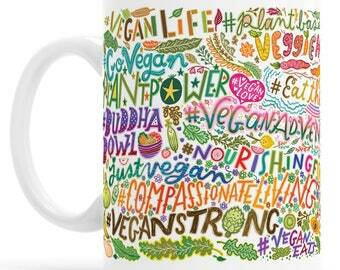 Once you order your mug, I then order it through Spoke and it is created JUST for you! :D It ships from Spoke's headquarters in GA right to you. My T-shirts are printed and fulfilled by The Printful in California, USA. 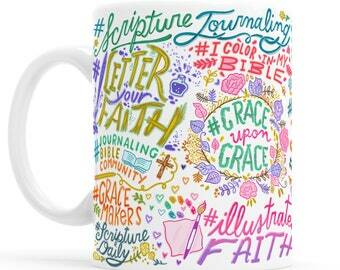 Creation of your mug (before shipping) CAN TAKE UP TO 4 (FOUR) BUSINESS DAYS PRODUCTION TIME. 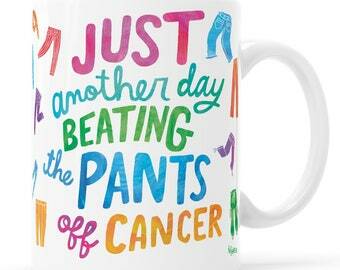 Please allow for this time when ordering your mugs. Thanks! 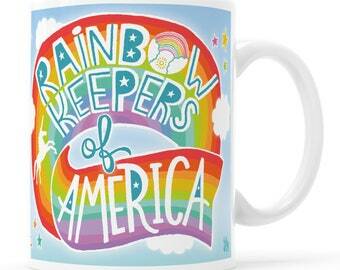 Larger orders of more than five mugs can take longer than four business days. 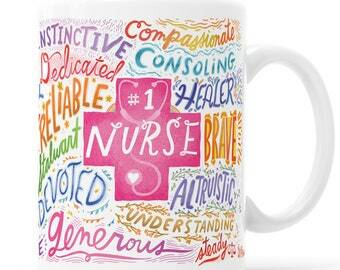 Please Convo Kathy before ordering if you need your larger order of mugs on a specific time line. PLEASE double-check that your address is correct. There have been instances of mugs mailed to old addresses because orders were placed with an old address in the "shipping address" area. I assume your shipping address is active and correct. I also try to ship as quickly as possible. So, when you place your order, 90% of the time it will ship lightning quick and if the wrong address is in there, there is going to be some mug heartbreak. Please avoid mug heartbreak: DOUBLE CHECK YOUR ADDRESS before you place your order. I cannot be held responsible for lost mugs that have been shipped to P.O. Boxes. Many P.O. Boxes are not large enough to hold a mug. Therefore storage for your package is unwarranted. Therefore, your mug may go missing , even though it was correctly delivered. 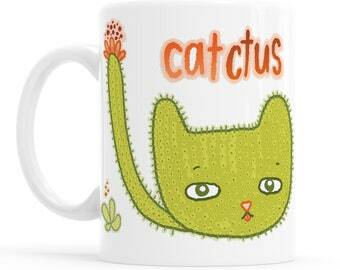 IF you are having your mug shipped to a P.O. Box please be advised that I DO NOT RECOMMEND this. 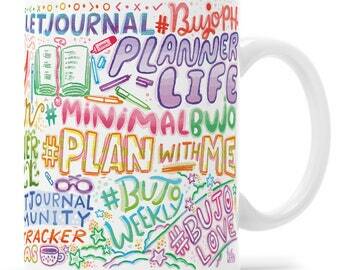 Mail my mugs to your P.O. Box AT YOUR OWN RISK. I HIGHLY RECOMMEND taking advantage of the "custom note on Packing Slip" option for mugs being mailed as gifts. I do this because , if the recipient is not expecting a mug and there is NO NOTE, they will call me and ask me who sent them a mug. 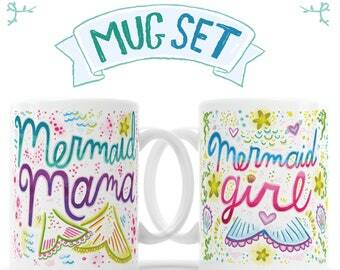 If you are interested in getting alterations to one of my existing mug designs, that is considered a custom mug. Both listings have ALL details in the listing regarding what is included in the custom mug design, what is NOT included, and how the commission works. 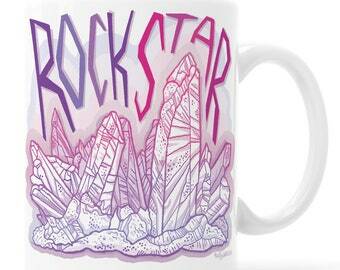 My custom mug designs are 100% HAND DRAWN. They take hours to do. They're a custom illustration commission. My prices reflect this. 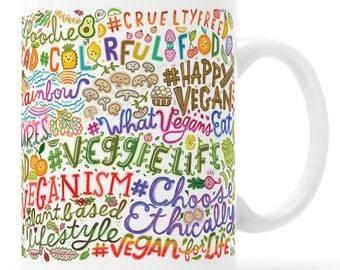 I put in the same amount of conceptual work, effort and illustration into each one as I put into all of my mug designs. 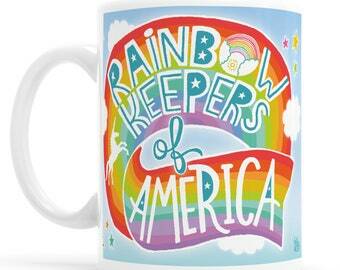 All this considered, I believe my prices are still very reasonable for custom mug art. 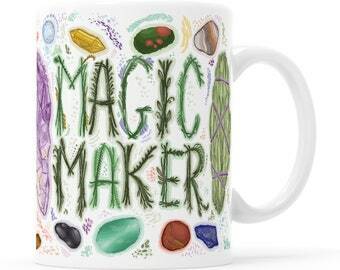 Most "custom" mugs on Etsy charge little to no additional cost for a custom mug. 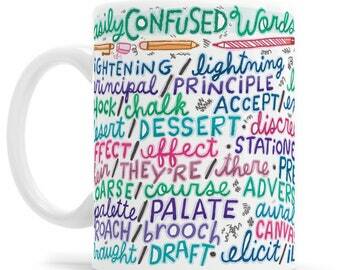 That is because they use fonts that are templated to the mug. It takes a couple minutes to type in a new name. This is a GREAT option, but this is not what I do. I hand-draw your entire design. Please make sure to tell me that you are from my ETSY shop! (NOT my other shop.) Thank you! All images on products in this store are Copyright © (date of creation) Kathy Weller, All Rights Reserved, and have been registered with the U.S. Copyright office. The images on the prints sold here are for your own private display and enjoyment of use purposes only. They are not to be reproduced or repurposed in any way, displayed publicly or in any other way through any other means than originally intended. No prints in this shop may be resold in any way. This storefront is direct— from artist to consumer.